Rice growing in paddy fields equipped with irrigation and drainage systems is less affected by unfavorable weather patterns such as prolonged dry periods and severe storms, but for the same reason, the fields discharge water to maintain suitable water depths even between rainfall events. Studies have been done to examine the quality of water drained from rice paddy fields during or after rainfall events. However, it is not clear how drainage affects the water quality of downstream waterbodies, especially during non-rainfall periods. We investigated the water quality characteristics of rainfall and non-rainfall rice paddy drainage, which was characterized by biological oxygen demand (BOD) and chemical oxygen demand (COD). 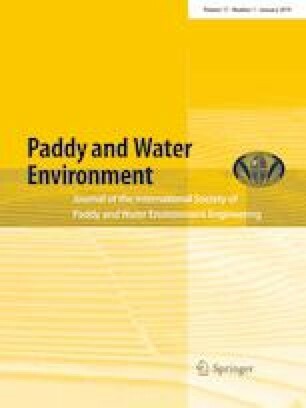 In this study, hydrological variables including water inflow/outflow rates, depth, BOD, and COD were monitored at a paddy field in Korea from 2008 to 2012. This study then quantified how BOD and COD loadings are controlled by irrigation and drainage management practices. Water quality measurements showed that rainfall events that resulted in rainfall depths greater than 50 mm are responsible for half of the overall BOD and COD loads discharged by rainfall events of the fields. On the other hand, a quarter of the total BOD and COD was attributed to events that provided rainfall depths less than 10 mm. The results suggested that the BOD and COD loads of rainfall events can be reduced by up to 25% if water at paddy fields is carefully managed in small rainfall events. Water samples taken during rainfall events had greater nutrient loads only by 6 kg BOD ha−1 (17 kg BOD ha−1 vs. 11 kg BOD ha−1) and 7 kg COD ha−1 (41 kg COD ha−1 vs. 34 kg COD ha−1) compared to those of the non-rainfall periods in the cropping season. Such a finding indicates the significant impacts of paddy field drainage practices on downstream water quality between rainfall events, particularly when considering a long period of non-rainfall. The monitoring data also showed that the standard unit load of 15.5 kg BOD ha−1 established for rice paddy fields by the Ministry of Environment, the environmental authority of Korea, is substantially different from the actual BOD load, because the non-rainfall BOD loads were not considered in the standard. Thus, this study suggests that non-rainfall BOD loads should be counted and managed for successful implementations of total maximum daily load programs. This research was supported by a grant from Environmental Basic Research program funded by Committee for Management of Yeongsan and Seomjin River Basin.